The two theoretical courses I teach are: Modern American Literature and Methods of Teaching. I was very excited about the second course, because I had spent a lot of time preparing for it and designing a syllabus that focuses on intercultural issues in TESOL, so I was eager to engage my students in discussion. But when I started teaching non-native Russian speakers at the university this semester I faced three big problems. 1). 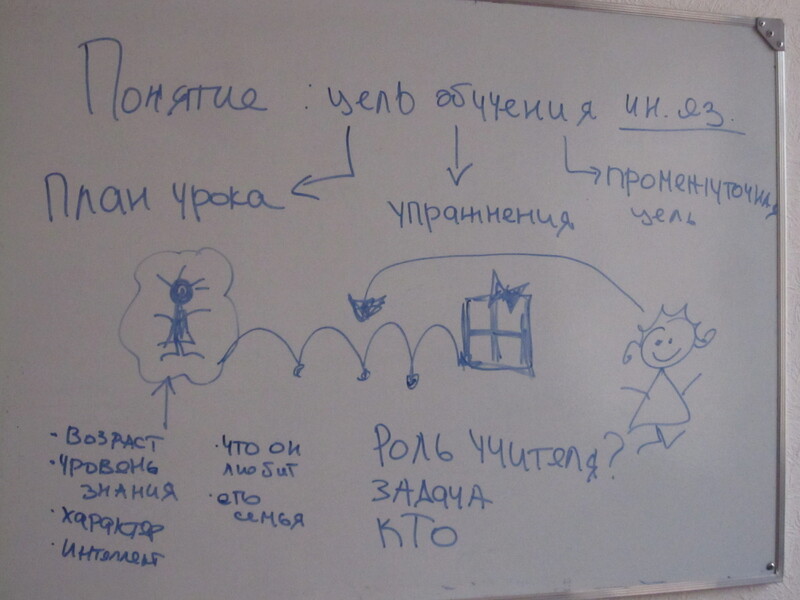 My students don’t speak Russian at the sufficient level to understand academic vocabulary. Well, even not so academic. For example, they weren’t sure they understood the expression “the goal of teaching”. 2). I teach seminars and due to problem #1 my students really had no clue what the course was about. 3). My students weren’t so interested in the course to begin with and they wouldn’t participate in any discussions, online activities or even answer my questions in class. I think it could stem from previous problems. Now, I draw everything I say. When talking about content-based instruction I drew a dumpling and by explaining how it has ingredients and how it is cooked in broth, I kind of delivered an idea. Then I used the salad analogy to explain how one can substitute different exercises that are the “ingredients” of the lesson. I am a horrible artist, but it doesn’t seem to outweight the fact that my students don’t undestand anything without pictures.